The success of the MOJO® spinning wing concept in the 90s became a phenomenon in duck hunting. 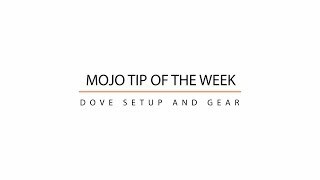 Found to work just as well on doves, this led to the development of the MOJO® Dove, which became the most popular dove product on the market. It functions as a long range attractor and finisher pulling doves in that would otherwise never see your set up. To provide a much more realistic view, the Flock A Flickers™ were developed for ducks, using the Spinning Wing concept but with several small wings with varying intermittent flashes scattered throughout the decoys. The Dove A Flickers™ bring that same game attracting ability to dove hunting in a smaller package specifically designed to set on the ground in the dove field. Scatter on ground in front of your stand for greatly increased attraction. With the Dove A Flickers™, no need to “get the right spot” in the dove field, instead make your spot the X! These are amazing worked great for a six man limit in South West Missouri always have been a great fan of MoJo!! Thank you so much for taking the time to leave this great feedback! We work hard to offer the most innovative and quality decoys out there. We hope that you’ll check out our other products as well! Feel free to drop us some pictures or videos from this year's season opener and we will feature you on our social media pages!